Prepare the Brussels sprouts by removing any dirty leaves, trimming the base a little, then cut in half. Boil in a small amount of water until just cooked, roughly 5-8 minutes. Drain and leave the lid off to allow the steam to escape. In a frying pan, heat the butter, then gently cook the bacon until it begins to go crispy. Now add the garlic and cook for another minute. Be careful not to burn the garlic. Add the orange zest then gently stir in the cooked Brussels sprouts. 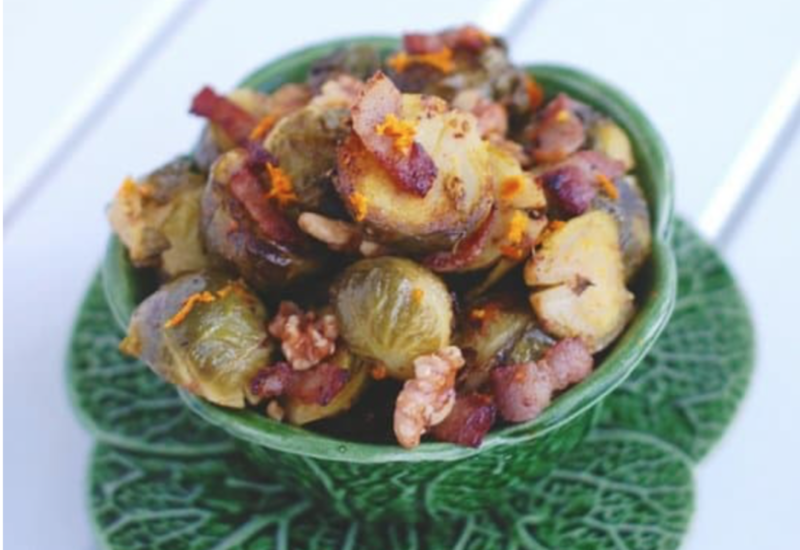 Stir while heating the Brussels sprouts and coating them in the buttery garlic sauce. Serve and use some walnut pieces to garnish.